Wootz! I am a happy girl! Nothing beats shopping spree during the weekend with girlfriends. Last month, Anne, Lysa and I make a trip up to Penang, well even it was a busy week for us but it did not deter us from doing the thing girls love the most - shopping. We had a great time and fun experience throughout our journey to Penang and of course the best part was our shopping spree at adidas NEO new boutique in Queensbay Mall, Penang. When we reached the adidas Neo boutique we were greeted by the staff and they give a quick briefing about the new store and also adidas NEO Label latest Spring Summer Collection 2014. We were so excited and mesmerized with the all the clothes, shoes, bags and caps and accessories. Really can’t wait to try on them. For those who are new to this brand, adidas NEO Label is part of the adidas Sport Style Division (home to adidas Originals, Y-3 and SLVR). Each of these collections represents a different aspect of fashion inspired by pop cultures and street style for the upbeat generation that features a multitude of colours, styles and designs with an accessible price point. Selena Gomez, as guest designer for adidas NEO Label launches her new Summer 2014 collection has added 27 hot summer pieces to her range from street style and creating a collection that blends soft pink tones with tough monochrome looks. I quite like her summer collection and I bought the summer dress and few tops. Overall the new adidas NEO boutique layout and display minimalist, chic and neat. I can easily identify or look for the items that I want. On the left is the adidas is the women section and on the right is the men section. There is quite a good selection of shoes and I love the summer colors is so vibrant. The staff were with us throughout our shopping, they help me to look for my shoes size, gives some suggestions and also help us to take pictures. Thanks to adidas NEO for the awesome shopping experience and I love all my adidas NEO stuff. Muack! Meantime, stay connected and visit sunshinekelly.com more often because I am going to share about my experience with adidas NEO brand apparel and my ootd (outlook of the day) in my upcoming post. To all my readers and followers, I have RM20 adidas NEO Voucher for all of you. You have to print and show to the cashier before you make your payment. You may use it as many times as you like from 16th May till 15th July 2014 but it comes with some terms and conditions. Only can be use in adidas NEO Queensbay Mall only. 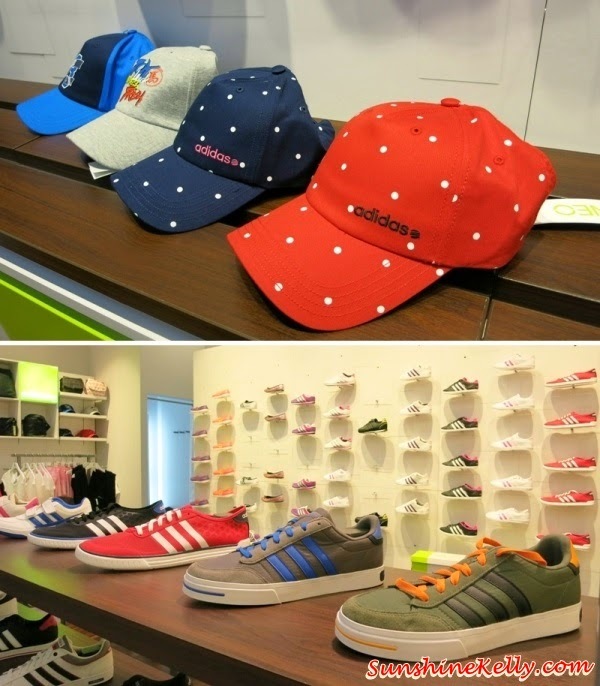 adidas NEO Label is available at 3rd Floor Queensbay Mall, Penang. Waahhh....u got so many shopping bags! I like the selena gomez pink flats how much is it?